Samsung’s Vice President Lee Jae-Yong was arrested on the 17th in South Korea. This marked the first time for a leader of Samsung to be arrested. Lee had avoided arrest last month due to the dismissal of his arrest warrant. However, Young-Soo Park (65, 10th Judicial Research and Training Institute) of the Independent Counsel Investigation team did extra investigations and finally managed to arrest Lee for further investigations. Lee is alleged to have embezzled Samsung’s money to give special support of about 37 million USD to Choi Soon-Shil, which accounts to bribery as well. Related charges include sending out property and assets without any kind of report, using a fake contract to disguise Lee’s bribery and embezzlement, and testifying wrong information during the government issued public investigation. As mentioned, the Independent Counsel Investigation team had issued a warrant for Lee’s arrest last month because he was found to have provided Choi with 37 million USD since Choi helped merge Samsung C&T with Cheil Industries. However, the court dismissed this considering the degree of the charge and incomplete investigation of bribery. Afterwards, the investigation team investigated for another three weeks to re-issue a warrant for arrest on the 14th. It is known that the criminal investigation materials were two times more than the first round. 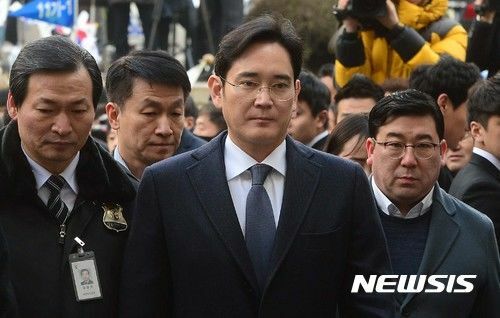 Sang-Jin Park, Samsung Electronics’ CEO and Chairman of the Horseback Riding Association, received investigation without detention because the alleged charges were the same other than his false testimony. Park is alleged to have played the key role in Samsung’s support for Choi. He is known to have met Choi in person last year in Germany, which is where suspicions suggest Choi made a promise that the government will support Samsung.